When you look at the sun, which way does she move across the sky? Think about that. Go out and look. Take your time. Where I am the sun moves across the sky from right to left. At this time of year she never sets, just moves around in a circle as the earth turns about its pole only a few hundred miles away. What brings me to this place? Why would anyone want to come here? All the usual reasons. Money, adventure, ego, education, probably several others as well but not necessarily in any particular order. Certainly there is money to be made here, and the opportunity for travel, to see places that one might never see otherwise is high on the list. Especially when I stop and think that the money I am being paid is far more than what I will ever pay in taxes. But I think it is the chance to travel, meet new people, new foods, learn new things that is the main drive. I first heard about this job when several people I had worked with at the Mount Washington Observatory and the Appalachian Mountain Club Pinkham Notch Camp came back to report on the beautiful sunsets and aurora at McMurdo Station on Ross Island. I remembered reading somewhere in one of my Scout books about Paul Siple, a Boy Scout who went on Byrd's first Antarctic expedition. It took Siple months to get to the Ross Ice Shelf, working his way, along side others in the expeditionary force, on the bark, City of New York. That was in 1939; today one can get here in two days if you make all the right connexions. Actually it takes only one day since you gain a day crossing the International Date Line. 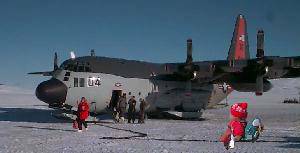 My journey really got started with the medical and dental examinations the Navy requires of all participants in the United States Antarctic Research Programme. Especially during winter-over there is only very limited medical assistance at McMurdo so you need to be in excellent health. After two days of poking and prodding and x-rays and needles-putting-stuff-in and needles-taking-stuff-out I was pronounced fit enough for the next step. That was a psychiatric examination at the Bethesda Naval Hospital in Maryland. The U.S. Navy is responsible for the overall operation of USARP and they want to be sure, as sure as they can, that all the winter-over personnel will not flip out when the sun sets for the last time. For just as much as there is continuous daylight in the summer south of the Antarctic Circle, in the winter there is continuous dark. Washington is a nice place to visit just like Boston is a nice place to be from; except for the Mall and the Smithsonian, they both look the same. The exam was interesting to say the least. There was about two-hundred questions, multiple guess, and no right answers. One that I puzzled over for a while was like on Sesame Street: One of these things just doesn’t belong here... a, dog b, bird c, cow; which would you choose? So much for tests, eh. Twenty-four hours of the World's Worst Traffic and I was back in the Land of the World's Worst Weather for a week of waiting for results and preparing myself for the possibility that I just might pass. I did, and suddenly there wasn't enough time to do all the things to be done. Write a will, shop for sox, put my bus up on blocks; the list went on and on and some of those things are yet to be done. Oh well, maybe they don't really need to be done after all. Ready or not the plane left Sunday noon. Monday I spent the morning at the office of Antarctic Services Inc. (ANS) a part of ITT, in Paramus N.J., filling out form after form of insurance, employment agreement, tax deduction, until almost too late to catch the next plane. I wasn't sure if my baggage made it onto the same plane but no matter there was such a headwind it would have time to catch up. Such was not to be. I changed planes in Saint Paul for Los Angles and the baggage didn't. It was busy being run over by a truck. I didn't find out until my computer didn't show up at LAX, and it wouldn't until after my next plane left. Well, that caused a day’s delay. All the hurry-hurry was lost, it would take most of the next day to replace the damaged bags and inspect their contents for hidden losses. By Tuesday evening everything was back on track and the flight to Honolulu was uneventful. I'd already seen the movie so used the time to make repairs and read. Besides, there is not much to see in the dark over water. The plane stayed on the ground in Honolulu for a couple of hours whilst they put a new tape on the VCR and restocked the galley with breakfast, then we were off to New Zealand. The excitement mounted; finally I would get a chance to use my passport. So far I'd been to all these places in earlier travels; New Zealand would be a new country for me not to mention going south of the equator. This was a long flight and fairly bumpy too. Finally I was able to find a place on the deck under the television screen to stretch out and sleep through another movie. Breakfast was nearly cancelled due to the choppy conditions but after several false starts the flight attendants were able to make a go of it and we had a not too mouldy omelet just before landing. At Auckland New Zealand, where the plane was met by a representative from ANS, the season was summer. I was over dressed. Kids were running around in shorts, even the customs agents were wearing shorts. I could hardly wait to get to my hotel and change. This would be my last chance to walk barefoot in the grass, to climb a tree, to be warm, for a year. With less than forty-eight hours till departure for “The Ice” there was no time to loose. The Croydon Inn is a bed and breakfast place only a few blocks from Cathedral Square in downtown Christchurch. In addition to the sun moving across the sky the other way round from what it does up north the people drive on the other side of the street, all the cars have their steering wheels on the passenger side. It takes some getting use to. There were lots of bicycles on the road and all over downtown there were special parking places for bicycles and motorcycles. At the bank I changed some U.S. dollars for N.Z. dollars. The exchange is in our favour just now so I got about 160$NZ for 100$US. But it really doesn't matter all that much because most everything costs more anyhow. The paper money is interesting in that the various denominations are different colours and sizes: ones are brown and smallest, twos are violet and larger, fives are red, tens blue, twenties green and the largest of the bills I had. Fifties are orange and the same size as the twenty. Bright and early Saturday morning I was back at the airfield for the long flight to Ross Island and McMurdo Station. By now there were several others like myself traveling in the same direction. First thing on the agenda was to get into our winter clothing because the flight over water to McMurdo was towards winter and we must be prepared for emergency landing and survival on the ice. Long underwear, wool trousers, heavy sox, mouse boots, bright red parka, hat, mittens, and special sun glasses. All that, on a hot December day that was like late June back home, weighed about twenty pounds and now we had to stand still and wait for customs and then transportation to the plane. The customs man went over us with a dog, the security man went over us with a metal detector and the load master checked everything with a scale. Then we waited. In the summer-warm passenger lounge of an airport in Christchurch New Zealand we peeled off layers of Antarctic clothing and watched "Chips" and "Beverly Hills Cop". Now I understand better why the boy who stopped to chat for a while on his way home from school yesterday thought that all Yanks come from California. The U.S. Navy plane we would fly on this time was not as large as some of the commercial liners I had been on in the past few days. It was a four engine turbo-prop with two extra fuel tanks hanging under the wings, a back door through which you could drive a truck, and around its wheels were skis that would permit it to land on the ice. All of our luggage had been piled on a pallet and tied down with a cargo net. This pallet, along with two others of mail and spare parts, had been loaded through the back door. We gathered on the flightline and listened to one of the crew explain ditching procedures and how to get into an exposure suit before boarding through a small hatch near the front where we were each given ear plugs to protect against hearing loss since this plane does not have the soundproofing of the commercial liners. The flight was long and noisy. I found a place to sleep on top of one of the mail pallets and was quite comfortable for a while even though I couldn't find any mail for me. As we neared Antarctica the clouds below broke and we could see ice bergs, stark white against the deep blue of the ocean, waiting, like parts of a jig-saw puzzle, for some giant to assemble. Seven hours after takeoff from Christchurch New Zealand flight zero-two x-ray delta bumped down on the Ross Ice Shelf of McMurdo Bay, Antarctica.